Do the framework agreements constitute a ‘new way’ of developing European employment law? Under what circumstances will a teleworker be able to act to obtain social protection under a framework agreement? Are we heading for a social Europe where mere recommendations, rather than labour market rules, are the norm? Where is the line between ‘regular’ and ‘non-regular’ telework? A consensus seems to emerge that the framework agreements, in their support of the transition from ‘job security’ to ‘employability,’ are leading soft law into what may aptly be called ‘liquid law.’ The papers include reports on implementation and development of framework agreements in individual countries including Belgium, the Netherlands, France, Germany, Italy, Poland, Sweden, the United Kingdom, as well as a report on the United States. 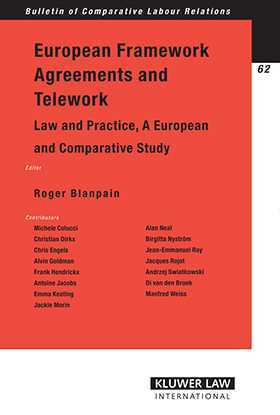 For the important and urgent questions it raises about telework and the ‘new world of work’ that telework so clearly represents, this book will engage the committed attention of everyone involved in the fields and activities shaped by labour and employment law in Europe and throughout the world. 1. The European Social Dialogue: A General Introduction; J. Morin. 2. The Framework Agreement on Telework; ETUC, UNICE, UEAPME, CEEP. 3. The European Social Dialogue and Voluntary Framework Agreements; R. Blanpain. 4. Report on the Implementation of the European Framework Agreement on Telework; ETUC, UNICE, UEAPME, CEEP. National Reports. 6. Belgium, the National Collective Bargaining Agreement on Telework; C. Engels. 7. Belgium and the Netherlands, E-monitoring the Teleworker; F. Hendrickx. 8. France; J.-E. Ray, J. Rojot. 10. Italy; M. Colucci. 11. The Netherlands; A. Jacobs. 14. The United Kingdom; A. Neal. 15. United States of America; A. Goldman. 16. IBM’s On Demand Workplace Strategy in a Nutshell; C. Dirckx.